A west Belfast man chased and caught after stealing £1,500 from a car was previously shot in the legs, a court heard on Tuesday. As Padraig Stilges was given a three-month suspended jail sentence, a judge was told he remains under paramilitary threat. The 20-year-old, of Norglen Parade, was among four men who carried out the raid on June 12. Belfast Magistrates’ Court heard the victim gave chase after seeing them around his car parked in the Little Patrick Street area. 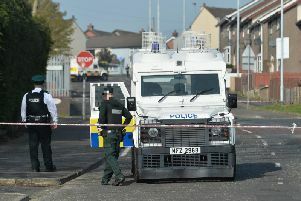 He pursued the group towards the city centre, going through Hill Street and Donegall Street. Other suspects fled, but Stilges was caught and held on the ground after bumping into a car. Nearly £1,500 in cash and a mobile phone belonging to the victim were recovered. Defence solicitor John Finucane described it as an “opportunistic enterprise”. Mr Finucane said Stilges was training to be a mechanic before being subjected to a gun attack prior to the theft. Stilges was shot in the knee and ankle and still has a bullet lodged in his leg, the court heard. According to his lawyer he has to sit down after being on his feet for 15 minutes. District Judge Fiona Bagnall suspended the jail term for 18 months and ordered Stilges to pay £65 compensation for a crack to the screen of the victim’s phone.